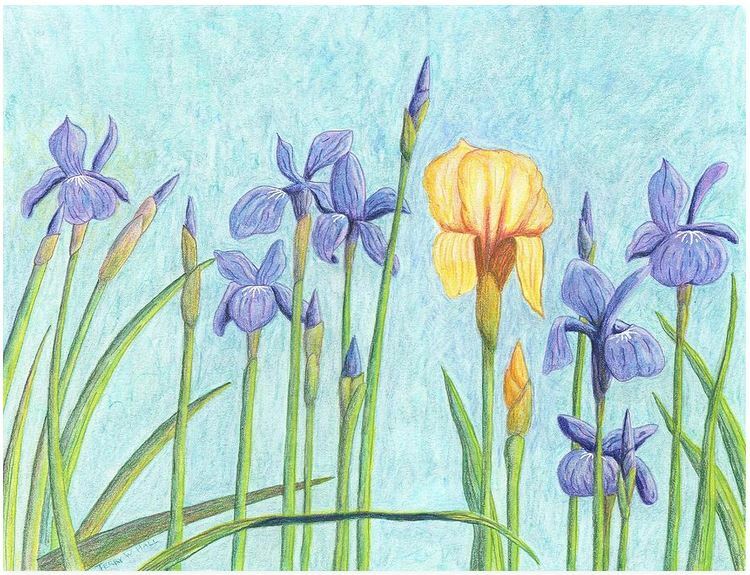 This colored pencil painting was inspired by the irises in our front yard. Our Siberian iris have been multiplying like crazy, so we moved some from the back garden to the front. Along with them, we planted a German (bearded) iris of unknown color (it was a freebie). When bloom time came in May, the German was yellow, which is a nice complement to the bluish purple Siberians. “Consider the lilies of the field, how they grow: they neither toil nor spin, yet I tell you, even Solomon in all his glory was not arrayed like one of these. But if God so clothes the grass of the field, which today is alive and tomorrow is thrown into the oven, will he not much more clothe you, O you of little faith? Therefore do not be anxious, saying, ‘What shall we eat?’ or ‘What shall we drink?’ or ‘What shall we wear?’ For the Gentiles seek after all these things, and your heavenly Father knows that you need them all. But seek first the kingdom of God and his righteousness, and all these things will be added to you.” Matthew 6:28-34 ESV.